Sony Ericsson and Fossil have teamed up to create the MBW-100 Bluetooth Watch. 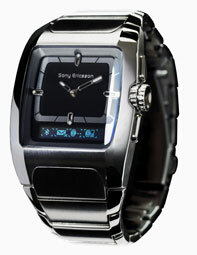 The timepiece incorporates Bluetooth technology from Sony Ericsson and watch technology and design from Fossil. The MBW-100 allows users to control calls and music from the watch. When a call comes in, the name or number appears on the OLED watch face. Text message alerts also show up. The Sony Ericsson MBW-100 will begin shipping in the fourth quarter for $399.